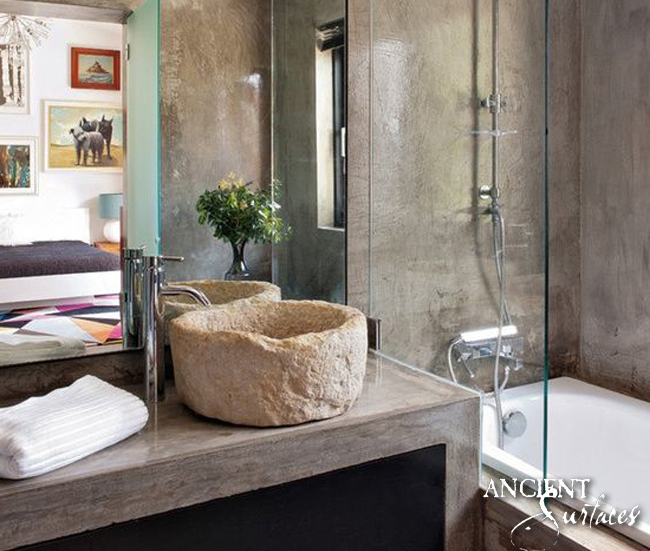 Ancient Stone sinks worthy of designing your entire bathroom around. 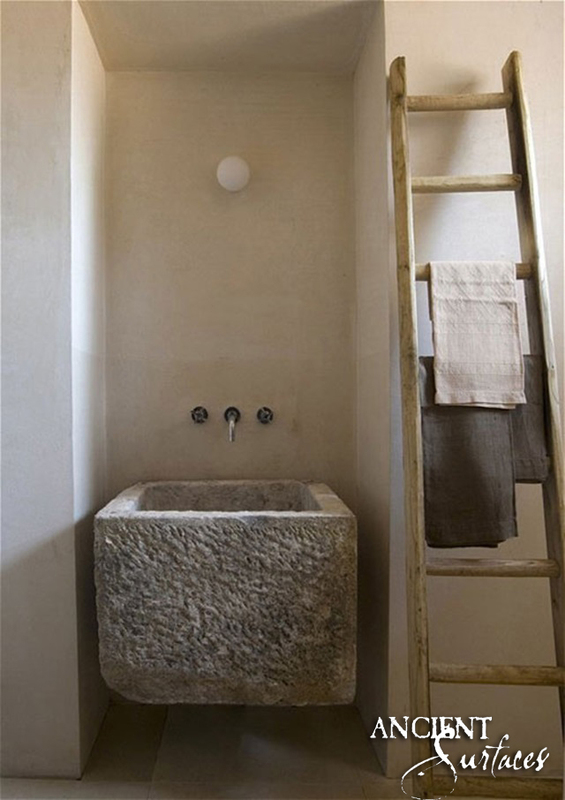 | Old Stone Sinks by Ancient Surfaces. 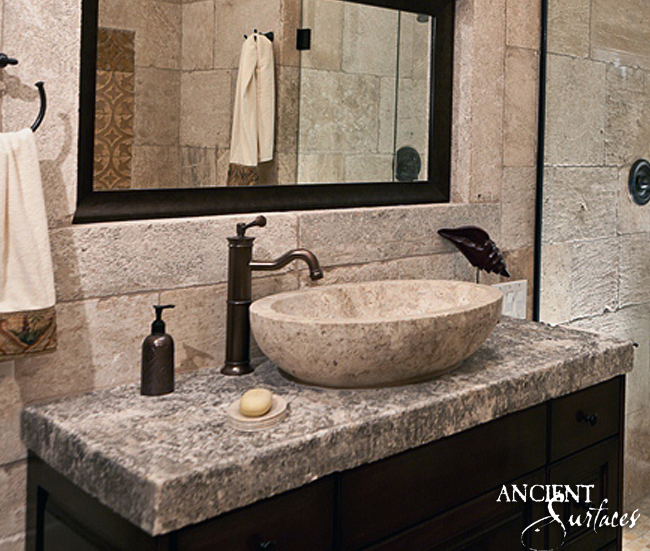 Ancient Stone sinks worthy of designing your entire bathroom around. If you are reading this, we are going to assume that you have encountered a bathroom sink before. Bathroom sinks are typically smaller than kitchen sinks (which must accommodate pots and pans) and have less function. Washing hands and faces, brushing teeth, and filling small cups are the main functions of a bathroom sink. They must also be hygienic, easy to clean, easy to reach, soft to the touch and of course very durable. Once these basic parameters are met, bathroom sink design is up to anyone’s interpretation. As a result, many different sink styles and materials are on the market. As you read on, we’ve recapped the most popular options you are likely to encounter while going through our bathroom stone sinks catalogue. 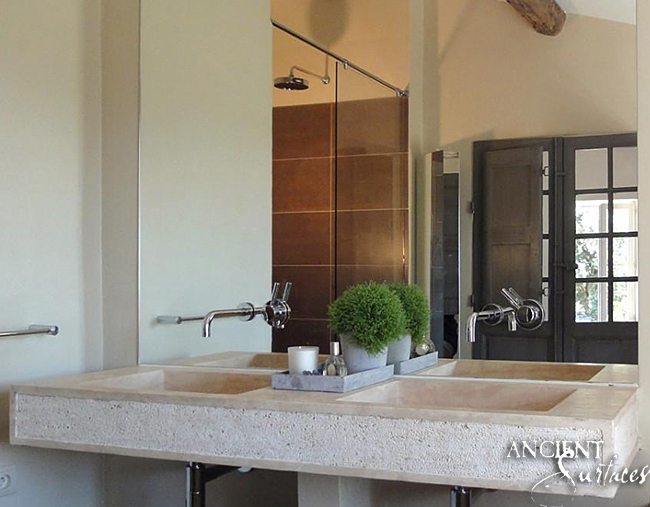 An elegant touch in any bathroom design can be realized with a rustic Basalt sinks. Just why is this so appealing? 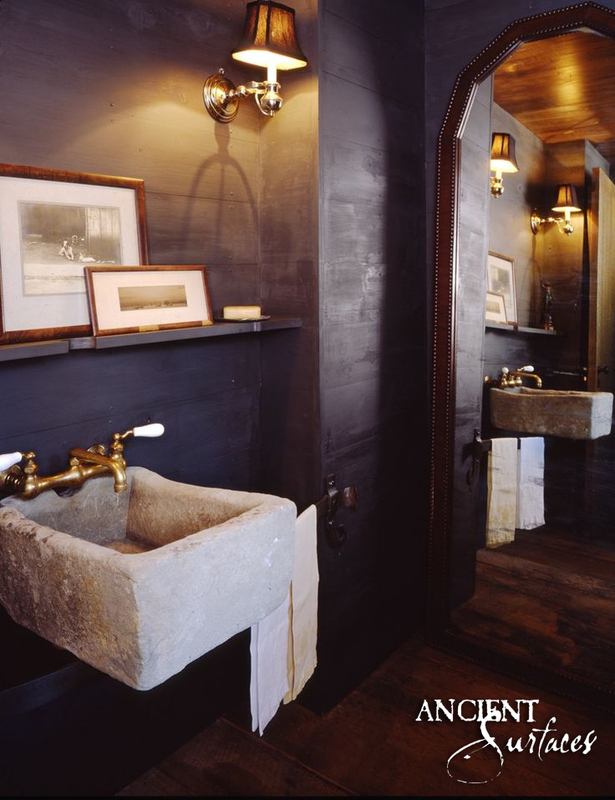 Many like the black/white contrast that is created through the enlistment of an antique Basalt sink. 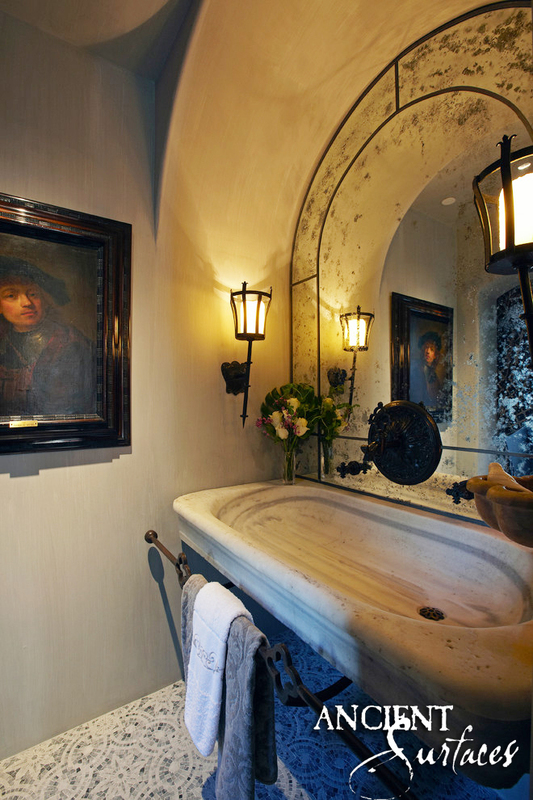 Guests won’t help but to be transported back in time to a Victorian or Georgian era of the British Empire anytime they glance at your contrasted powder room design complete with its weathered West Indies style Basalt vessel. 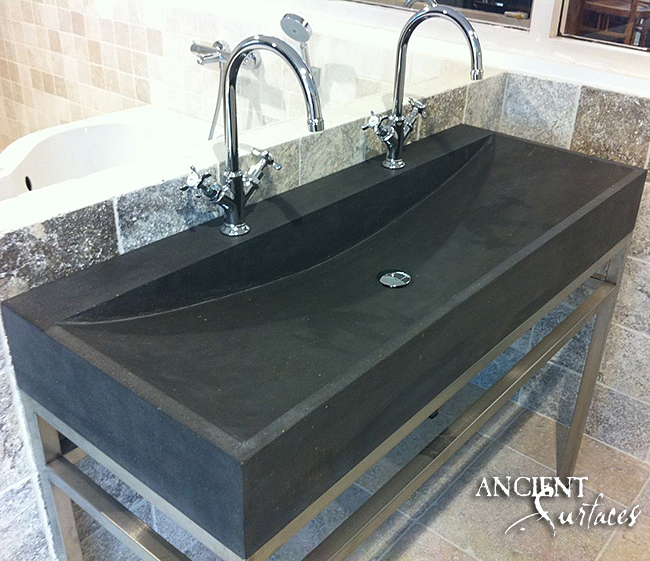 Another trend is to replace existing sinks with thick solid stone vanities topped with a bowl-style vessel sinks. They’re eye catching, unusual and add an edge to any personal style. 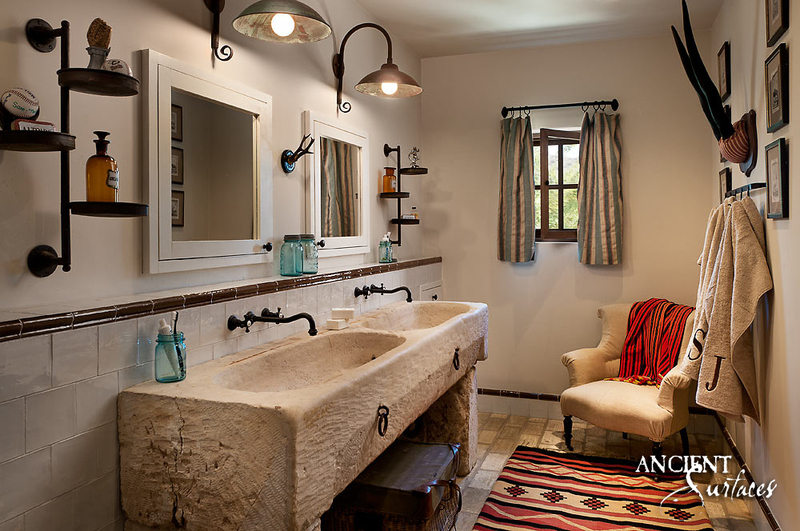 Weathered bowl sinks add a frugal country cottage minimalism to traditional bathrooms. 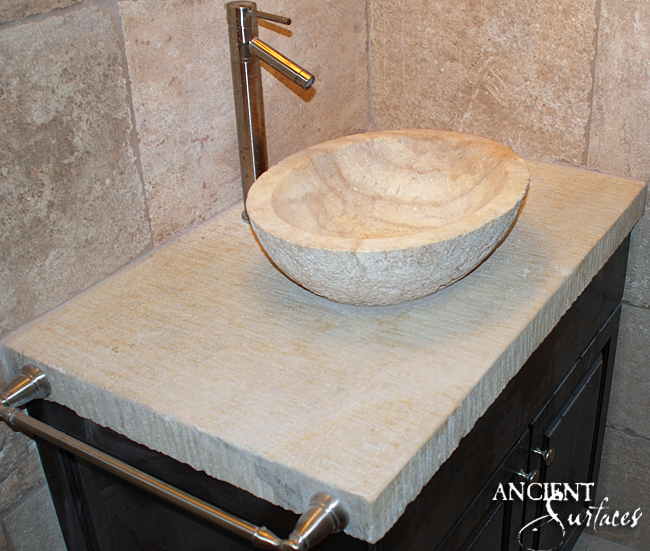 Bold limestone bowls have become a staple in contemporary and traditional bathrooms alike. Juxtaposing old with new has turned into a defining characteristic of our 2010-2020 design era. 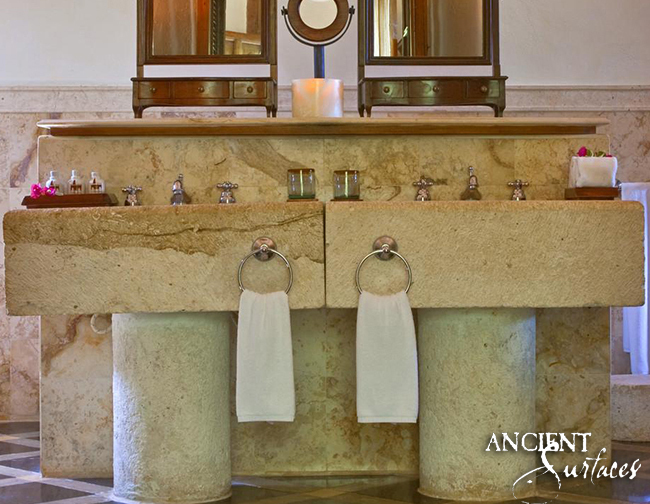 Limestone has always been key to making bathrooms feel time-honored and serene. You want warmth? Add limestone! 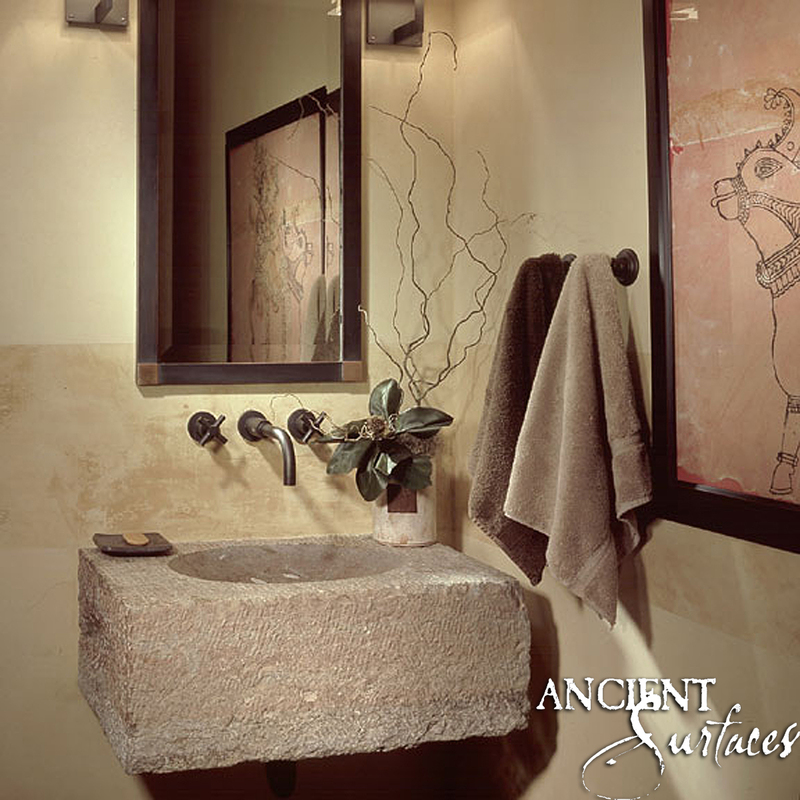 This design dogma isn’t reserved to contemporary bathrooms but has been known since the days of Minoan villa design some 5,000 years ago. More and more people have started to realize that elementally worn natural stone sinks are a must in any trend tolerant bathroom design worthy of a front cover feature in any national shelter magazine. There’s something to be said about stone that was softly eroded over centuries not by the sheer force of steel mallets but by the gentile & perpetual motion of soft rain droplets landing on its exposed surface sitting in nature for centuries. 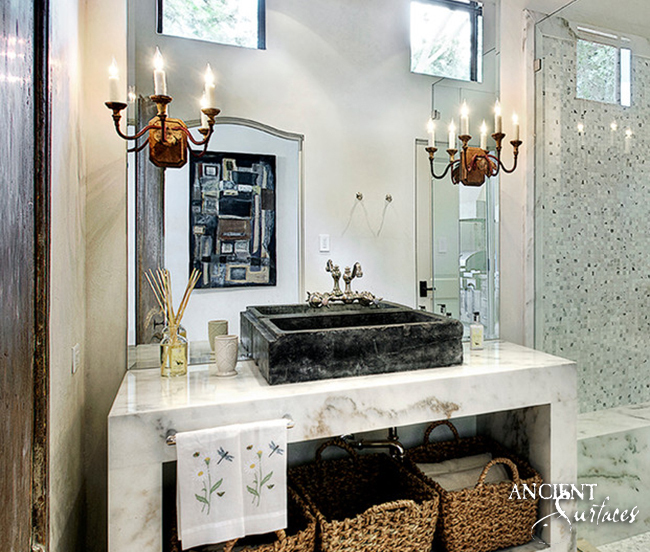 ‘His and Her’ bathroom sinks design layout helps to create a symmetry especially when the creations are monumental and artistic as in the case of pedestal sinks. 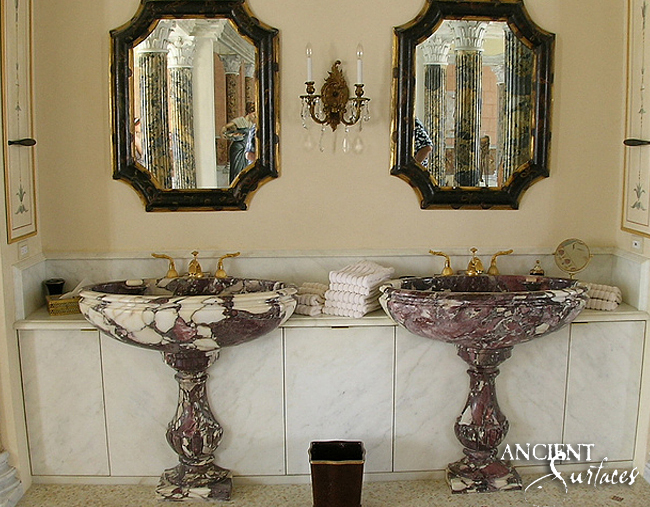 Those sinks have much in common with outdoor wall mounted garden fountains and work very well with other classical bathroom features such as full hand carved marble tubs and period mirrors and sconces. Undermounted bathroom stone sinks are sinks that are installed below the vanity or countertop and mount from below. 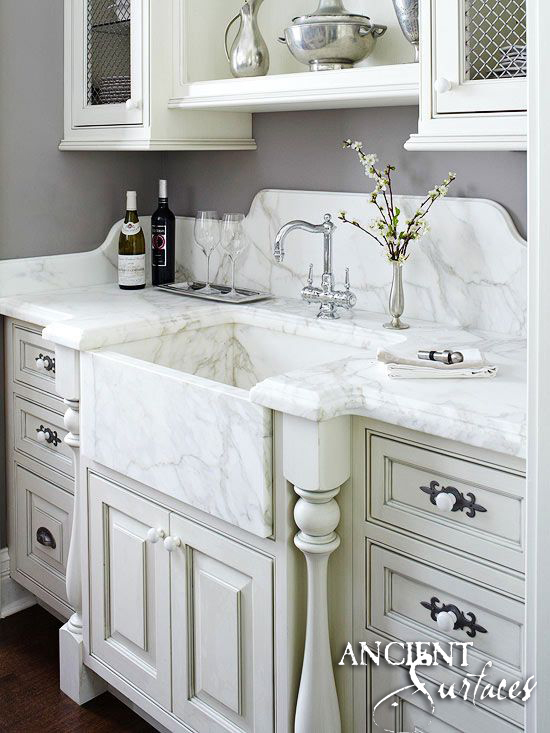 Undermounted sinks hang flush or slightly below the countertop for a seamless look that is easy to clean. These sinks do not have a lip like drop-in sinks, leaving more counter space for toiletries and a smooth surface for cleaning. The Sink below brings a furniture-like feel to your bathroom vanity and go perfectly with the tub and chair. Those full length bathroom stone sinks are truly remarkable looking and just like trough sinks they will help you add volumes of sophistication, liveliness and playfulness to your bathroom. 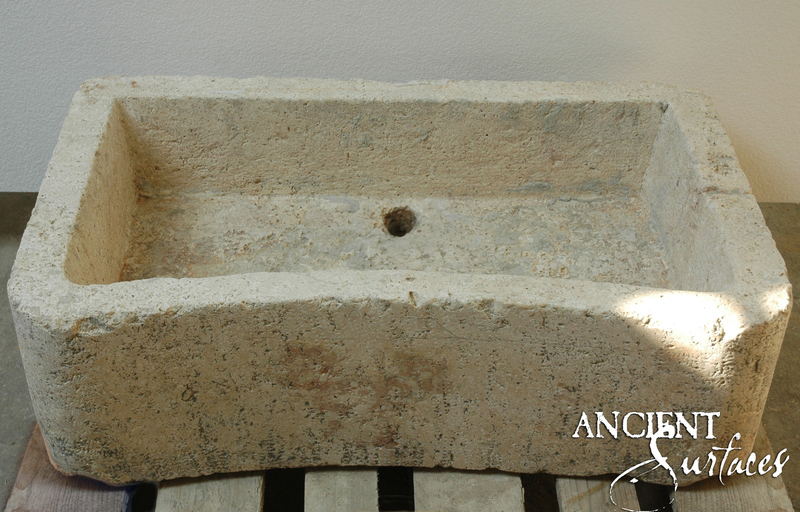 Antique stone sinks. A Journey in time and space. Old World Kitchen Basalt Sinks by Ancient Surfaces.